The Florida Institute for Health Innovation (FIHI) believes that today’s health challenges require a new way of working based on shared leadership; aligning root causes and strategy and measureable results. We believe that innovative collaborations produce innovative solutions for healthier communities. A nonprofit public health institute, FIHI facilitates data-driven, results-based collaborative action; conducts community-focused research and evaluation, and provides impartial analysis of policy health impacts. Founded in 2001 as the Miami Dade County Public Health Institute, the Florida Institute for Health Innovation (FIHI) originated with the operational support of the Miami Dade County Health Department (MDCHD). 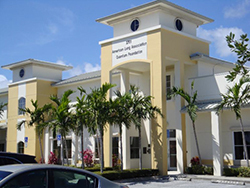 From 2006 – 2007, FIHI reincorporated as the Florida Public Health Institute, moved to Lake Worth, Florida, and was awarded a total of $1.25 million in core funding from the Quantum Foundation and the National Network of Public Health Institutes/Robert Wood Johnson Foundation for infrastructure and program development. Since then, FIHI has evolved from its mostly local focus on Palm Beach County to addressing the needs of the state of Florida and the southeastern region of the United States. The FIHI team has grown from a staff of three to an internal team of six plus an additional group of consultants. In 2014, we completed a year-long, in-depth rebranding process that included an analysis of staff and stakeholder interviews and group sessions. This process resulted in a new name, mission, logo and three new centers of excellence: Collective Impact for Healthy Communities; Health in All Policies; and Research, Evaluation and Training. Moving forward, we are working according to our new mission: To create healthy and sustainable communities, the Florida Institute for Health Innovation champions innovative public health policy and cross-sector collaboration.